"Damian Lazarus plays the best underground records in the world"(DJ Magazine 2004) Time to blow away the mediocrity. Time to bury the has-beens that have gripped the dance world. Damian Lazarus is leading the change. He is one of a small number of DJ's delivering a fresh sonic surge of forward thinking music and new dancefloor perspectives. Best described as dirty and deep, this is electro house and much more besides. This is a Rebel sound designed for lovers of late night madness, future dance floor classics and cutting edge new ideas. It's time has come. Damian has quite a history. As former Head of A&R for London based label, City Rockers, Lazarus divided his time between signing and developing the next wave of future bands/artists and spinning the most vibrant new tunes to like minded clubbers. He was responsible for putting together the genre-defining and critically acclaimed Futurism compilations and signing and releasing classics like Felix Da Housecat's Silver Screen, Tiga's Sunglasses and Coloursound's Fly With Me to name just a few. That's not all. Damian received a major Djing break in 2002 when he was invited to spin at Barcelona's Sonar Festival and by 2003, he had residencies at some of the best club spaces in the world. For the last two seasons his back room sessions at Circo Loco (DC10 Ibiza) have become the stuff of legend - the crowds now rewarding his sets with 'sit down' ovations on the dancefloor. 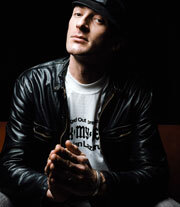 With his style and sound developing and keen for some of the new and exciting electronic artists to get the attention they deserve, Damian launched his own label, Crosstown Rebels in 2003. Inspired by the new energy in international club culture, the label's ecords offer twisted angles for worldwide party people. Rebels is firmly dedicated to the support and development of the best cutting edge electronic dance music. It loves quality alternative sounds, adores a great party and thrives on creative, young people armed with something new to say. Rebel artists include Kiki & Silversurfer, Pier Bucci, Phonique, Hiem, Adam Sky, and Frankie Flowerz, to name a few. Its faultless A&R policy and forward thinking attitude has rewarded it with international acclaim, winner of 'Best Evening Beach Party' at Sonar 2004 and all round 'next big thing' status. Go to www.crosstownrebels.com and plug yourself in. In early 2004 Damian released his first ever DJ mix album. 'Rebel Futurism Session One' came out to great critical acclaim. It even picked up a review in Rolling Stone magazine in the States. Damian also hooked up with Families and released the fourth in their series of free legal download mixes (www.audiofamilies.com) in September 2004. It broke all records with 10000 people from around the world downloading the album in just one month. Quite incredible! Damian is currently preparing the hotly anticpiated 'Rebel Futurism Session 2'for release in February 2005. A proper labour of love, all tracks have been roadtested for inclusion by Damian in the past six months. Expect something very special. Damian's DJing antics having taken him to such respected spaces as Fabric in London, Zouk in Singapore, Rex in Paris, plus DJing tours to Australia, Mexico, plus other dirty and sweaty underground parties around the world. Not forgetting all the marathon after party DJ sessions! 2005 is firmly set up to be yet another special year. Always a lover of'proper' music, and not a fan of mainstream music machines, Damian Lazarus is a believer in giving people something exciting, special and different. For that he should be applauded. It's time to Rebel!.